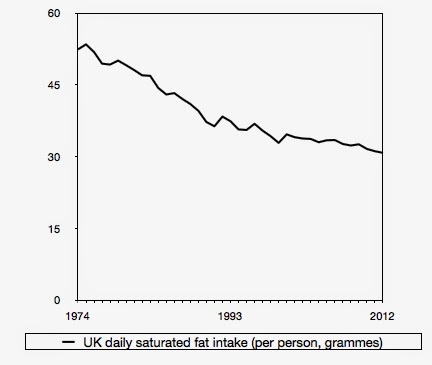 Overall intake of calories, fat and saturated fat has decreased since the 1970s. This trend is accompanied by a decrease in sugar and salt intake, and an increase in fibre and fruit and vegetable intake. This is so far removed from what the public is told by groups like Action on Sugar that it deserves some elaboration. 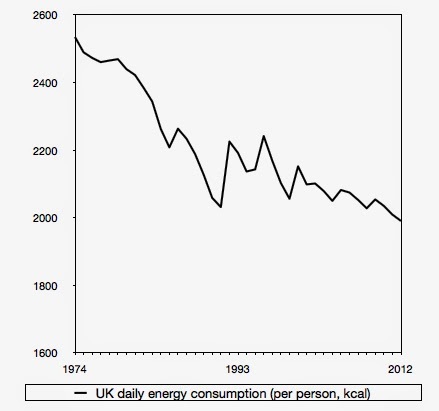 The Office for National Statistics holds detailed information on the British diet going back to 1974. The evidence is unequivocal that per capita consumption of sugar, fat and carbohydrates has fallen significantly. 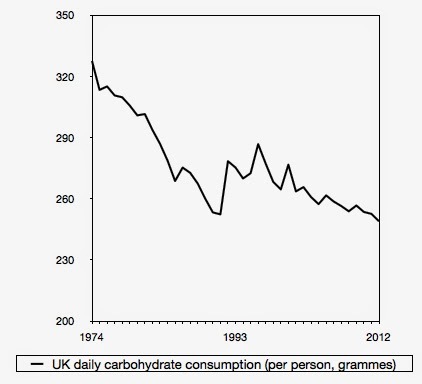 If consumption of sugar, fat and carbohydrate has fallen, what has risen? The answer is: not much. There's been a small rise in Vitamin C and protein consumption. Otherwise, nearly everything has declined or stayed static. 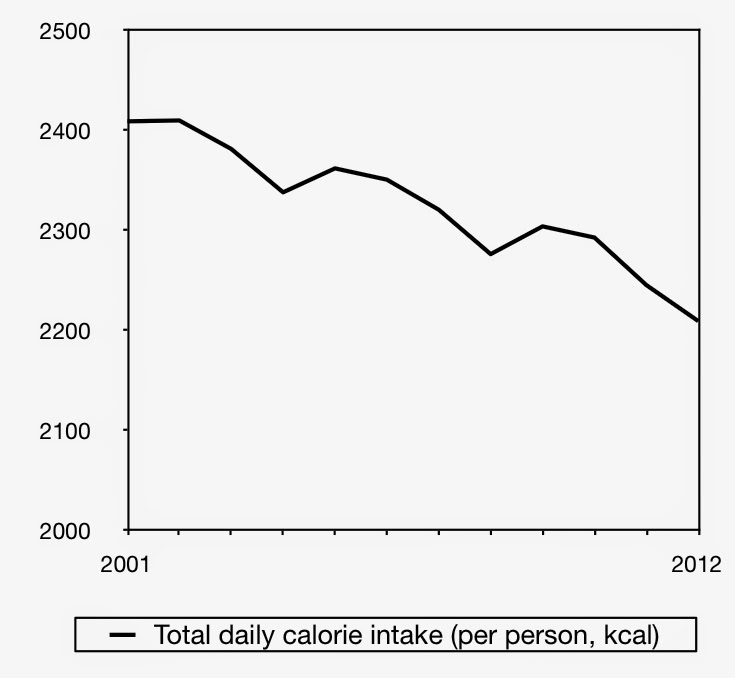 Unsurprisingly, then, calorie consumption is also down, from 2,534 calories per person per day in 1974 to less than 2,000 in 2012 (nb. these figures include calories from alcohol). At this point, I should add a caveat. The figures above refer only to food consumed in the home. Have we been increasingly stuffing our faces in restaurants and chippies? Well, no. Food consumed outside the home makes up about ten per cent of total energy intake and, although we only have evidence on consumption outside the home going back to 2001, there is no sign of a rise here either. On the contrary, since 2001 the number of calories consumed outside the home (including snacks) has fallen by 30 per cent, from 310 to 219 per day. In 2012, the last year for which we have data, total per capita calorie consumption in the UK was 2,262 per person per day. This is considerably less than people were consuming in the home, let alone from all sources, in the mid-1970s. The facts are clear. Britons, on average are eating about twenty per cent fewer calories than they did forty years ago and we are eating 16 per cent less sugar than we were in 1992. So, if we're getting fatter despite eating fewer calories (and if we believe the first law of thermodynamics) there can be only one explanation—we are burning off even fewer calories than we are eating. There are a few things that might have made a difference to metabolism, such as warmer houses and the decline of tobacco smoking, but the overriding explanation is the decline in physical activity. The claim that obesity rates have risen because we are being fattened up with fizzy drinks, large helpings and 'hidden' sugar in food is bunkum. The cause of the obesity 'epidemic' has nothing to do with calories in and everything to do with calories out. Considering how many news stories are written about obesity, you'd think that the facts above would be common knowledge. If there was a physical inactivity industry for the public health lobby to attack (Big Slob-acco), perhaps they would be. Instead, we have a food industry known by the risible moniker of 'Big Food' (the 'men who made us fat') being blamed for stuffing the population with more and more sugar and calories despite no such increase having taken place. Who needs facts when we can blame obesity on people "being bombarded every day by the food industry to consume more and more food" or when we can point the finger at a product that the British have never eaten? In an increasingly sedentary society, those who are not prepared to do more exercise may find it easier to reduce the number of calories they consume than to live a physically active life. That is not an unreasonable response (although exercise has health benefits that go beyond obesity prevention). It can certainly be argued that calorie consumption has not fallen fast enough to offset the decline in physical inactivity. For many people, that is obviously true, but let's not pretend that it was rising calorie consumption that caused obesity rates to go up after 1980 and let's ignore irresponsible barkers like Aseem Malhotra who want to "bust the myth of physical activity and obesity". It is not a myth. Physical inactivity, not increased calorie consumption, is behind the rise in obesity in the UK. 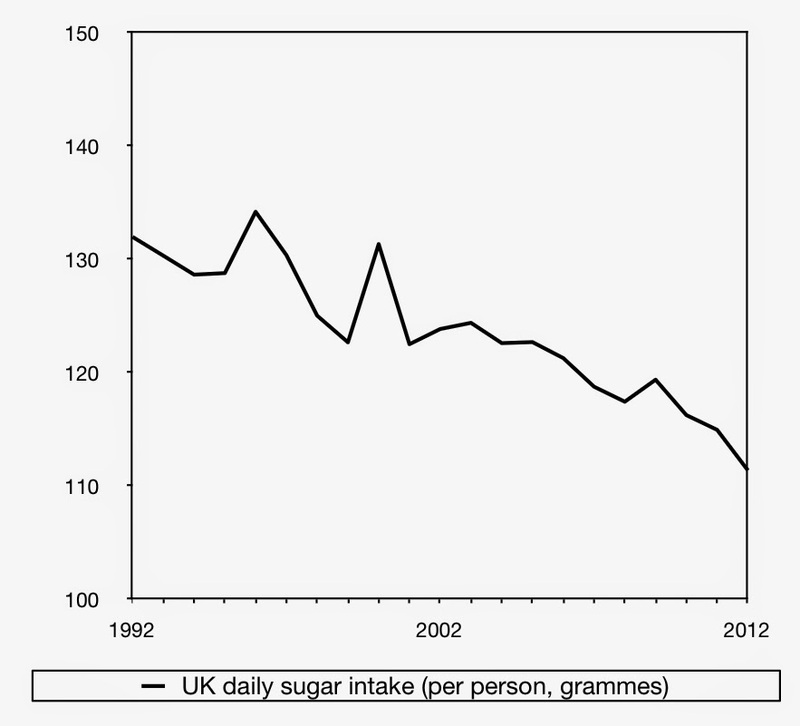 It should be noted that the USA and Britain are different insofar as calorie (and sugar) consumption remains higher in the USA than it was in the 1970s whereas both are lower than they used to be in the UK. Actually, I think you'll find if you look that of the total energy budget of any mammal (or bird, for that matter) the bulk actually goes on keeping warm. The one factor that has changed markedly since the 1970s is the prevalence of central heating. I was born in 1970, and remember growing up in a 1950s semi. I remember waking up to ice on the insides of the single-glazed windows; we simply did not have heating of any sort save a rarely-used electric heater in the bedrooms (I was strictly forbidden from using this, as it cost money to run). As time went on, we upgraded the gas fires, added a small heater in the hallway at the bottom of the stairs then joined the posh set when we installed triple-glazed windows, then central heating (and got rid of the hallway heater at the same time). We went from upstairs temperatures not so very many degrees above outside ambient upstairs, to near-constant 20 celcius day and night. Our clothing has also improved over the last thirty-odd years; most clothing in the seventies was natural fibres and not actually all that warm, or waterproof. I remember when Barbour wax-jackets were state of the art in outdoor clothing, for instance. Building heating has got much better, cars are warmer, clothes are better insulators now. We are using much less energy on keeping warm, doing less as we don't need to move about to keep warm, and eating almost as much. That's why we're getting fatter. Very interesting topic. However, I have one question: how do they measure a global "obesity rate"? They don't put everyone on a scale and it seems awfully complicated to tell how many people are obese. How can you constitute a "representative sample" of the population? Obesity depends on your food intake, your age, your lifestyle and a number of unknown factors. And then you have to find a method that allows for comparisons between different countries. The "obesity rate" is supposed to be 11% in France and 25% in the UK, which is a huge difference, and I find it difficult to believe. 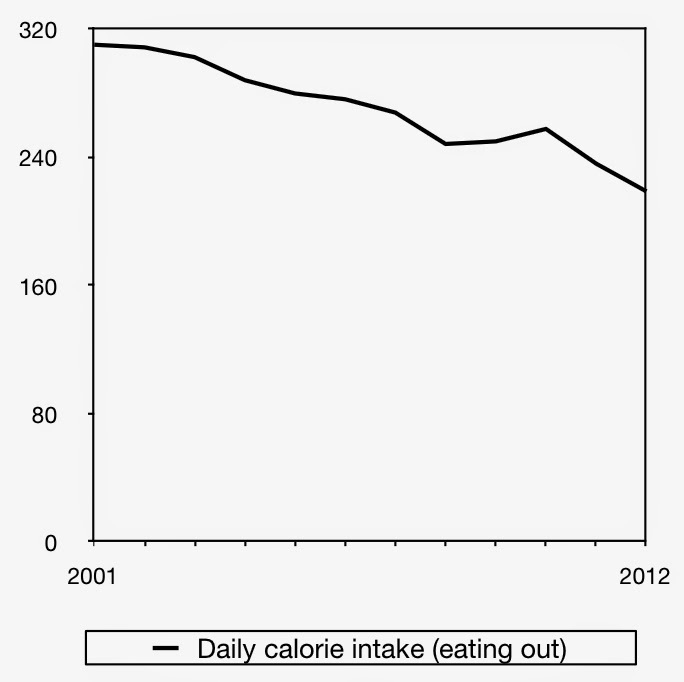 If the figures are accurate, total calorie consumption has fallen by over 150 a day since 2001. This equates to walking a couple of miles each day. That a heck of lot and not much else seems to have changed since 2001. I find it difficult to believe that on average people have become that less active over a recent period of 11 years. Here, for example, not much of a decrease in walking and only since 2009. I've no explanation for what's going on, but the figures appear inconsistent to me. I'm feeling too lazy to google (my bad! ), but I suspect a comparison of obesity rates in cities known as walking or biking towns would tell a great deal. I lived in Manhattan in the '70s and loved that I could walk everywhere—a three-mile walk from my work to my home was nothing then. Now I'm in Minneapolis, and I love its commitment to bicycle paths and light rail. "I remember when Barbour wax-jackets were state of the art in outdoor clothing"
I used to wear one under my combat jacket in winter. They're far more robust than Goretex, which always started leaking on the shoulders where webbing & rucksack straps abused it. U.S. health club industry revenues in 1972: $200 million. The People's Vote - why don't they just do it? Have We Gone Nuts About Protein?